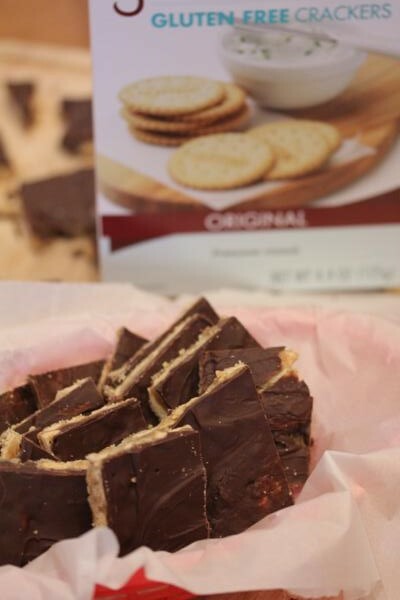 Gluten Free Cracker Toffee is a holiday favorite made gluten free! Today I am sharing a holiday classic made gluten free. If you grew up eating the saltine cracker toffee candy you will love this. Yes, I made it gluten free. 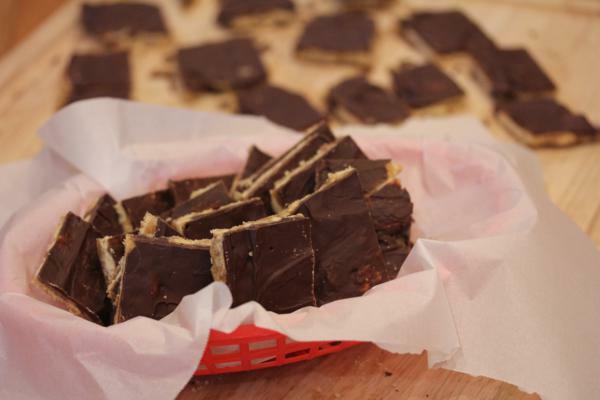 This gluten free cracker toffee is just as good as the original version. The gluten free version of this recipe is thanks to my sister. A few weeks ago we were talking on the phone and she mentioned that she made a gluten free soup for dinner and served it with Glutino crackers. As we were talking about holiday baking she said she thought that the Glutino crackers would work great in the cracker toffee that my mom used to make when we were kids. I loved the idea and decided that I had to try it. Like right away. I did not have my mom’s recipe, but all the recipes that I have seen are pretty much the same. The main difference is that some have nuts on top and some don’t. The version I am sharing today is pretty much the basic version, but with gluten free crackers. My sister and I thought this would work, but you never really know with gluten free until you try it. As soon as I took a bite of this I knew it worked. It tasted so close to the real thing. The texture was slightly different, but it was pretty close to what I remember the regular version being. The main difference I noticed on these was how it broke apart. With the original version you use saltine crackers which are square. Glutino crackers are round. With a square cracker the candy breaks apart pretty easily into squares. With the round candy it doesn’t break apart quite as easily or pretty. It works and it tastes great, but I will say the gluten free version is not quite as pretty of a candy. But taste is what matters, so I don’t care if the crackers are round. It works fine. If you have been missing cracker toffee since you went gluten free, give it a try with Glutino crackers. I think you will enjoy it! 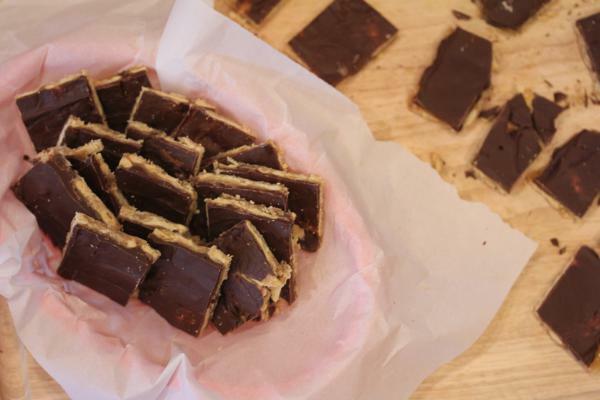 An easy gluten free version of a favorite homemade candy. Line a large jelly roll pan, or cookie sheet with sides type pan, with foil. Grease foil. Lay crackers on the foil fitting as many as you can on the sheet without overlapping the crackers. In a pan combined butter and brown sugar. Bring to a boil and boil until it turns a caramel color. This will take a few minutes. Remove from heat and carefully pour evenly over crackers. Remove from oven and sprinkle chocolate chips on top. Place back in oven for about 2 minutes or until chocolate is just starting to melt. Spread melted chocolate evenly over the candy. Let pan cool completely. Refrigerate if needed to harden candy. 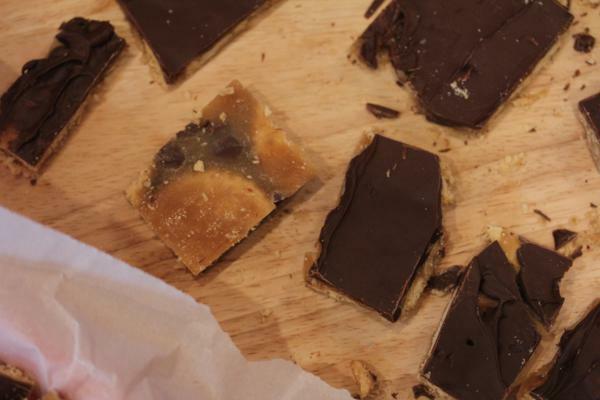 I use the Schar Table Crackers when I make Gluten Free ‘Cracker Toffee.’ They are square.